Schwartz is with Heure who repeatedly smashes a mirror until a strange man appears inside it. Heure explains (thanks to a tip from Tsukasa) that one out of a thousand times, a broken mirror momentarily connects to the Mirror World. Heure approaches the mirror and proposes a contract with the man using a Ryuga Watch. That will allow the man to connect to this world. The man takes the watch and Another Ryuga steps through the mirror. 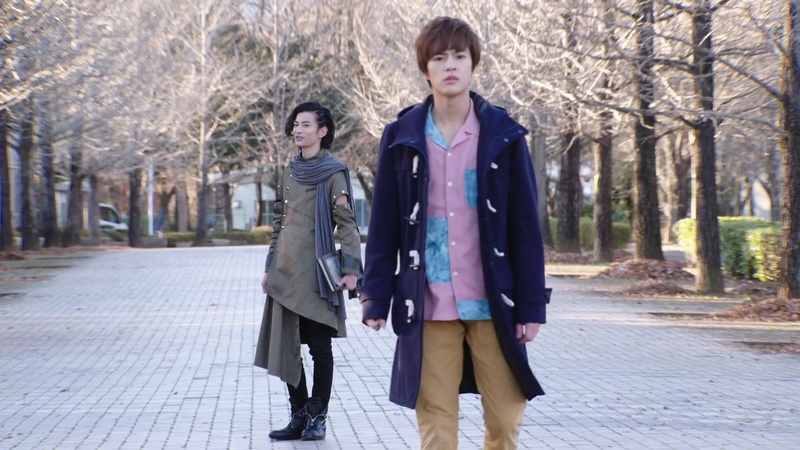 Sougo and Geiz try fighting Ryuga, but are unable to gain the upper hand, especially when Another Ryuga can reflect their attacks back at them. Geiz goes Drive, but it still doesn’t help. Another Ryuga knocks both Sougo and Geiz down and is able to escape. Back at the shop, Tsukuyomi notes this is the 5th time this week that the Another Rider has slipped through their fingers. They never know where the Rider escapes to. Geiz says what’s worse is the Another Rider’s ability to reflect their attacks. They have to prepare to be defeated themselves. Tsukuyomi thinks these more powerful Another Riders mean the TimeJackers are also preparing for Oma Day. Sougo asks what exactly Oma Day is. Geiz explains that it is the day Sougo uses Oma Zi-O’s power to destroy the world. But Sougo remembers ShiroWoz saying Geiz defeats him on Oma Day. Tsukuyomi says that’s because he’s from a different timeline. 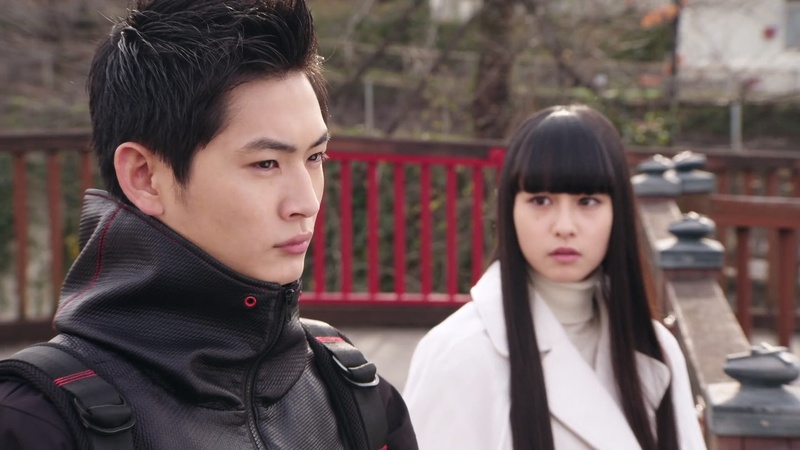 And depending on the outcome of Oma Day, it’ll be between Tsukuyomi and Geiz’s future and ShiroWoz’s future. Then there’s the TimeJackers who want a third timeline. That’s why Oma Day is so important. Sougo asks Geiz which future he wants. The one ShiroWoz has told them about? Geiz says he would never trust ShiroWoz. Sougo points out they both want to stop Sougo from becoming Oma Zi-O though. Seeing Geiz is speechless, Tsukuyomi changes the subject to the Another Rider. She’s been trying to look for a connection between the victims the past week. The one connection was that they all followed ORE Journal on social media. The three of them decide to split up to find out more information. 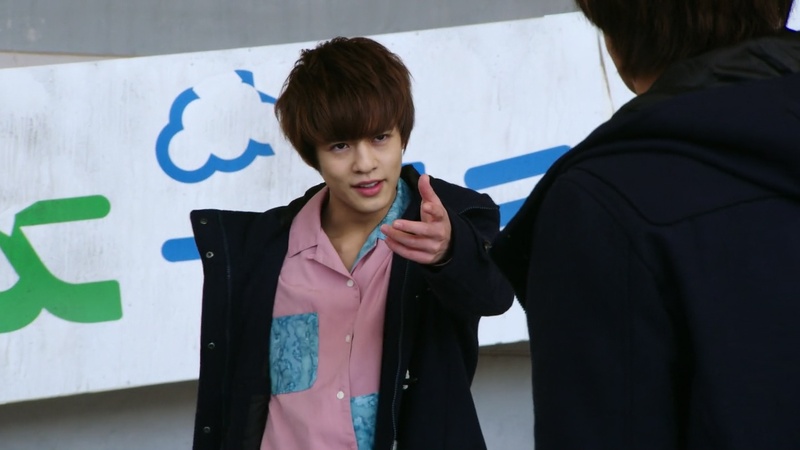 Sougo finds Ookubo, the former editor-in-chief of ORE Journal. ORE Journal was a news site powered by reader-submitted stories. But the rise of social media rendered ORE Journal obsolete. Ookubo says they had a dedicated staff, especially journalist Kido Shinji. 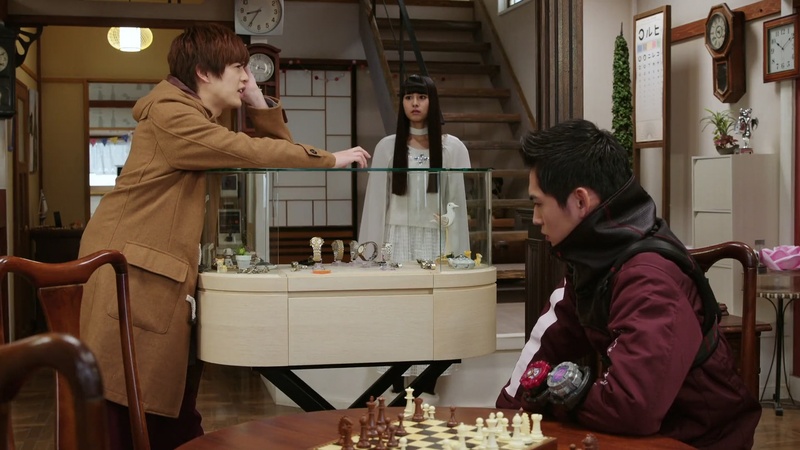 Sougo, Geiz and Tsukuyomi visit Kido’s apartment. But no one answers the door. Geiz is able to open the chained door and they peek inside to see man lying on the floor. Geiz yanks the door open and they hurry in. They find windows and almost everything else covered with newspaper. 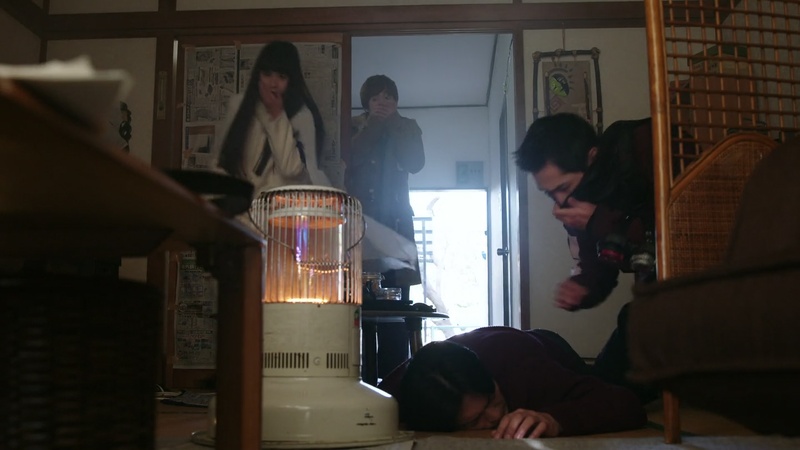 Geiz realizes the man might have passed out from carbon monoxide poisoning since the gas heater is also turned on. They quickly open the windows and Kido briefly regains consciousness to say they shouldn’t do that as “he” will come. Later that night, Sougo returns from the hospital to say Kido will be fine. Tsukuyomi has found more information. She’s found CCTV footage from all the other victims incidents and they find the Rider can pass through mirrors and anything with a reflective surface. But the Another Rider being able to reflect attacks means he’s practically unbeatable. Geiz says there is one way. That is, to defeat the Another Rider before he can reflect the attack. But they would still have to prepare for the chance their finisher will reflect back to them and basically end them. 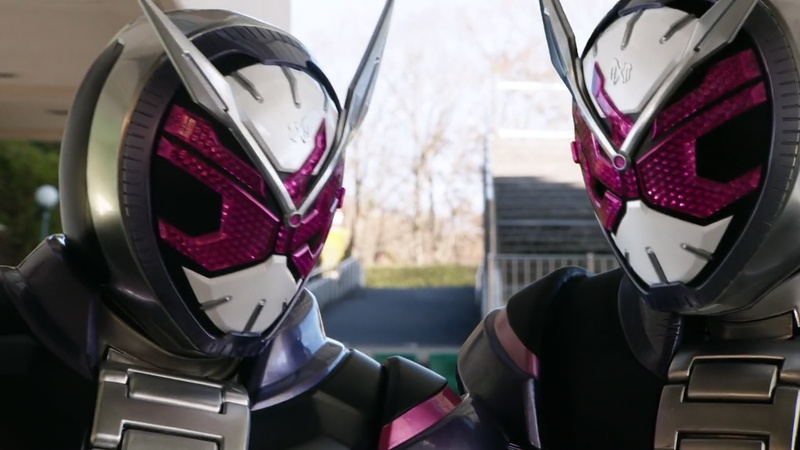 Sougo tries thinking of a way to defeat the Rider before the reflection. 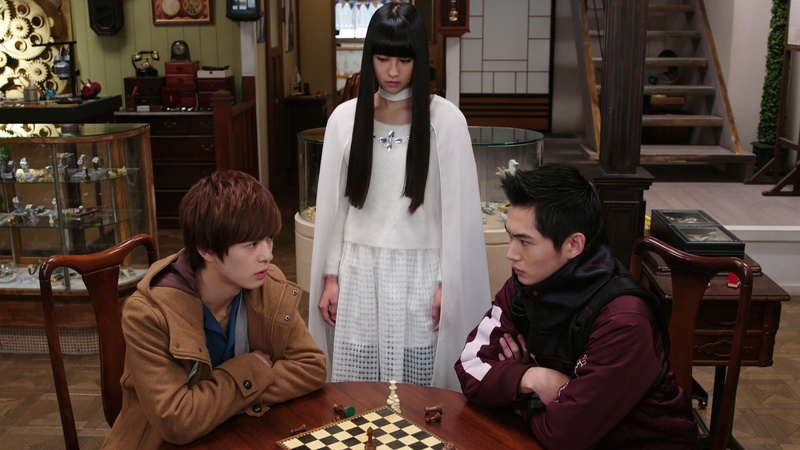 But Tsukuyomi worriedly notices Geiz has other thoughts. Next morning, Uncle Junichiro tells Sougo that both Geiz and Tsukuyomi left early. He also asks Sougo about Woz since he wasn’t able to fix the Watch he gave him. Sougo is surprised to see it’s a Zi-O Watch, but not filled in. Sougo heads out, still trying to figure out how to defeat Another Rider. KuroWoz appears and asks Sougo how it was to meet Kamen Rider Ryuki, Kido Shinji. Sougo realizes the Another Rider must be Ryuki, but KuroWoz says he’s wrong and it’s not that simple. KuroWoz says the Another Rider is a mirror being. Sougo asks about the Watch KuroWoz left with Uncle Junichiro. Woz says originally, Sougo used it on Oma Day. But he proposes Sougo use it now so he can be unstoppable, especially since ShiroWoz and Geiz seem to be planning something. Tsukuyomi asks Geiz what his plan to defeat Another Rider is. He says he has to die. He calls ShiroWoz and asks what future awaits them if he defeats Sougo on Oma Day. ShiroWoz says it would be a world like this one, as peaceful as if time has stopped. Geiz remembers losing his loved one in the future and the possibility of that not happening in the new future. Geiz asks ShiroWoz to use his laptop to defeat Another Rider. But ShiroWoz says that’s not necessary. Meanwhile, Kido Shinji wakes up in the hospital and quickly gets up to try and run away from all the reflective surfaces around him. ShiroWoz meets him in the stairwell and hurls him down the stairs. ShiroWoz stops Kido from running and explains to Geiz that the only way to defeat the Another Rider is to kill Kido Shinji. ShiroWoz henshins and attacks Kido. But Geiz henshins and stops him. He will not allow ShiroWoz to kill an innocent person. Geiz tells Kido to run and he battles ShiroWoz. Kido passes by glass windows and sees… himself? Suddenly, the Another Rider pops in and introduces himself as Kamen Rider Ryuga. Heure explains that this man was another version of Kido Shinji who existed in the Mirror World, but is now gone. So they certainly can’t go into a mirror that’s been lost like they travel through time to make a Watch with. That makes Another Ryuga invincible. ShiroWoz repeats that the only way is to kill Kido Shinji himself. But Heure says that’s not going to work either. ShiroWoz goes Futureing Quiz to ask if he can defeat Another Ryuga. The answer is No and Woz gets thrown back. Geiz tries delivering a finisher at Another Ryuga, but Sougo stops him. Sougo says he would never allow Geiz to sacrifice his life to defeat the Another Rider. Instead, Sougo pulls out the Oma Watch, but nothing happens when he tries to activate it. Another Ryuga steps into the Mirror World, but Sougo grabs on to him and he gets sucked in too. When Sougo comes to, he finds himself in a literal world of mirrored things. Suddenly, a more sinister-looking Sougo appears and welcomes him to the Mirror World. MirrorSougo explains that he is Sougo, but Sougo is not him. MirrorSougo henshins as does regular Sougo. Interesting episode! So, not having watched Ryuki (or even Kamen Rider Dragon Knight, to be honest), I come into this Ryuki arc not knowing a thing about the original season. So the whole Mirror World stuff is definitely new to me. It presents a very interesting dilemma and I’m looking forward to seeing how it is resolved of course. With the Zi-O events themselves, it almost seems like ShiroWoz wants to freeze time. Literally. That’s certainly a very different future from anything any of them might dream of. But I think we can be sure ShiroWoz isn’t telling Geiz everything about the outcome of a Geiz-defeating-Sougo Oma Day. Just like KuroWoz is also keeping something very important from Sougo about the future he wants as well. 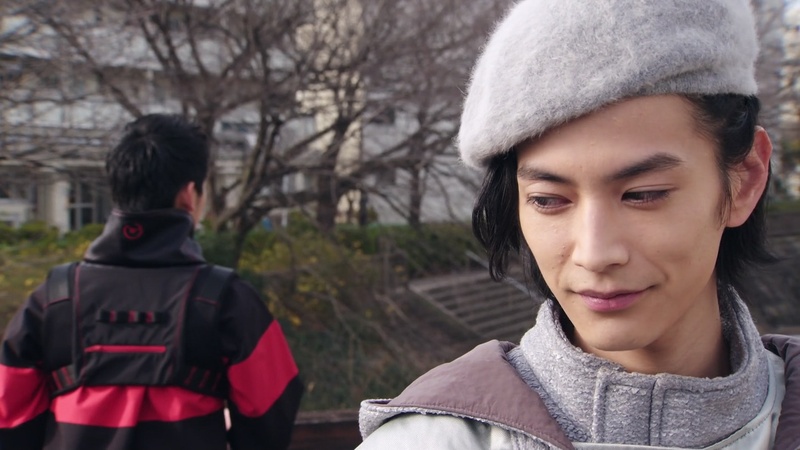 Again though, I think we get more back and forth between Sougo and Geiz only to see that they really are in sync with each other in their minds and in their hearts. They want the same thing. But the way to that goal is different for each of them. I’ll assume the right path is somewhere in between and only them working together will allow them to achieve that goal. Ryuki was essentially; a Mirror World tournament. Monsters in this dimension attacked people, and select people with a Vent driver (card deck/belt) forms contracts with certain creatures to become Riders. The goal was to fight other monsters to feed your contract monster while defeating the other riders in order to secure a wish. It had some great characters involved ( a businessman fighting to cure himself, a serial killer seeking the thrill, the dynamic between Shido (Ryuki)and Ren (Knight) as both struggle to decide if they will have to inevitably fight each other to the death) and a surprisingly dark and bittersweet 2-episode finale that I won’t spoil here. The movie; like most early Heisei era Kamen Rider films, did an alternate take on the outcome of the series, with surprise cameos from the cast of Agito. Very interesting. My only exposure to Ryuki are the Ryuki eps of Decade which I just recently watched. Sounds like a fascinating season.